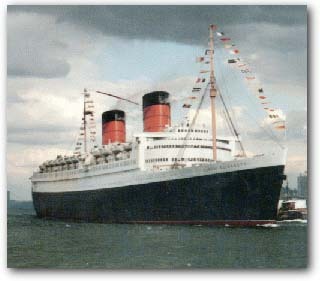 Overview: Queen Elizabeth was launched on September 27, 1938 and due to the war in Europe, her maiden voyage ended on 7 March 1940 with a surprise arrival in New York Harbor. She began this voyage by secretly leaving her fitting-out basin and heading for her home port of Southampton. As she headed down the Clyde, her captain opened his orders which directed him to take his new charge to New York. 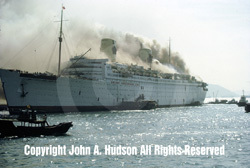 On March 21, 1940, further orders were received to proceed to Singapore and then Sydney to meet her future running mate RMS Queen Mary. After conversion work was completed she spent the remainder of the war moving troops around the world. On most voyages she carried between 13,000 and 15,000 troops. 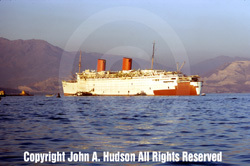 During her war service she carried over 811,000 passengers and sailed over 500,000 miles. At 83,637 gross registered tons, she would be the largest passenger ship afloat for the next 34 years. She was released from war duty in March 1946 and underwent an extensive refit. She finally left on her maiden passenger voyage in October of the same year and began a 20-year career of transAtlantic crossings. 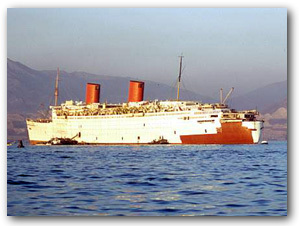 During the mid to late 1960's as the number of people crossing the Atlantic by ship continued to decline, Cunard began offering her for more cruises. 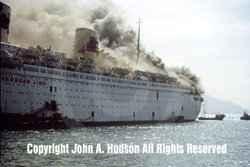 Unfortunately, she lacked many of the essentials expected of a cruise ship and even the addition of a swimming pool and central air conditioning in 1965 proved too little, too late and the once great ship continued to lose money. Queen Elizabeth made her final Atlantic crossing on 5 November 1968. At the time she had already been sold to a group of Philadelphia businessmen for �3.25 million. 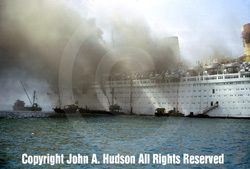 After this she sailed to Port Everglades and was opened to the public in February 1969. By the end of the year she had been closed down by the local authorities as a fire hazard and was losing money. 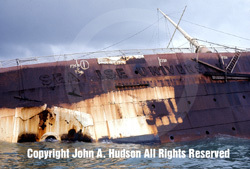 She was sold to a group of businessmen headed by Mr. C. Y. Tung and renamed Seawise University. The plan was to convert her to a floating university. 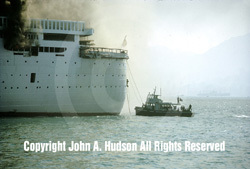 During the refit in Hong Kong much of Queen Elizabeth's original interiors were removed and new machinery and furnishing were added. 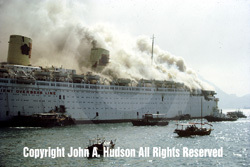 By early January most of the conversion work had been completed with the notable exception that the ship's fire suppression systems had not been activated. 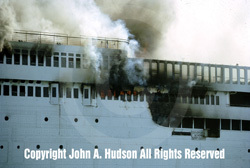 As a result, when the fire broke out on January 9th the small band of workers on board were in no position to combat the flames and the fire quickly spread throughout the interiors of the ship consuming the luxurious woodwork that had once made the Queen Elizabeth one of the more elegant ships at sea. 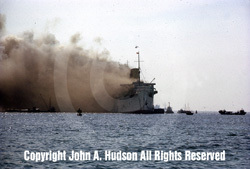 As you can see from the photos below, a number of fireboats did eventually arrive but by that time they were no longer in a position to stop the blaze. 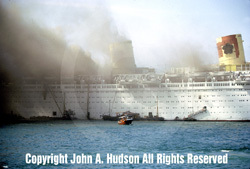 As the fire weakened the interior support structure of the ship, and more and more water was pumped onto the upper decks, portions of the ship began to collapse and she eventually capsized onto her starboard side. The exact cause of the fire was never firmly established, although rumors of arson or insurance fraud have been cited by conspiracy buffs over the years. 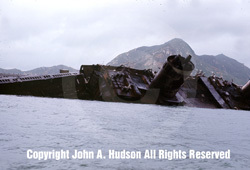 The wreck remained in Hong Kong Harbor for a number of years and was prominently featured as the MI6 Headquarters in the James Bond film, The Man with the Golden Gun. 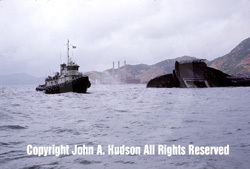 The bulk of the above-water wreck was cut down for scrap and the remaining underwater portion became such a navigation problem that it was eventually removed and folded into the landfill used to provide the foundation for one of the runways of the new Hong Kong International Airport. 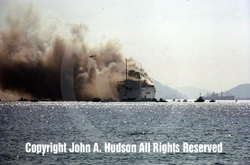 The following eyewitness account of the fire and the photos of the burning ship below were provide by John A. Hudson who was living in Hong Kong at the time. I arrived in Hong Kong from England in early July 1971, single, recently qualified as a chartered accountant, and with a job arranged with one of the major international accounting firms. I had high expectations and as events unfurled I was more than rewarded with success and happiness during our subsequent four years in Hong Kong. Good fortune beckoned from day one in Hong Kong. On day four I met a British Army school teacher who had been there since September 1970. Six weeks later we got engaged and were married in Sussex, England in August 1972. We are still married. 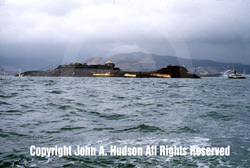 On Saturday 9 January 1972 my fianc�e's parents, who had come from England to meet their future son-in-law, my fianc�e and I were out on Victoria Harbour in a small boat taking in the sights and enjoying an afternoon on the water. There were no special events happening and the harbour was no less busy than on any other day of the week except to say that there were few if any other pleasure boats in the vicinity. 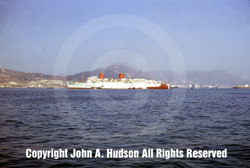 Among the ships riding at anchor in the harbour was the retired Cunard liner Queen Elizabeth 1 in process of being converted into a floating university and aptly re-named after its new owner, Mr. C.Y. Tung, as Seawise University. 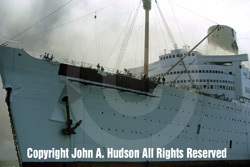 What caught our attention from a distance across the water was smoke coming from the ship's portholes; not just one or two portholes but from almost all of them from stem to stern on one side. 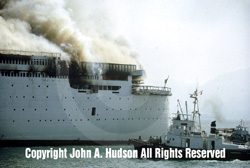 Considering the size of the vessel, almost 84,000 gross tons and 1,031 feet long, and no visible signs of any other problems, the sight of smoke was alarming but also rather fascinating. What was happening on board? 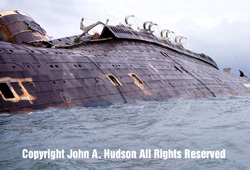 It was well known that the vessel was being refitted for its new life afloat and had a sizeable work crew aboard. 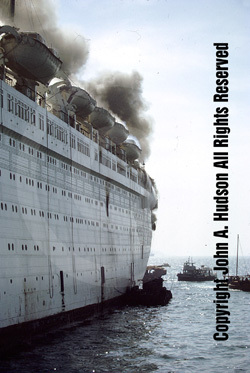 There was no sign of added human activity on board, no fire boats alongside, and no sign of any thing out of the ordinary other than smoke blowing through the portholes. The vessel was riding at anchor on a calm Saturday afternoon. This was one time when I should have had an extra roll of film! Having only one partially used thirty six exposure roll of Kodachrome 25 made for some careful choices in what to shoot with my borrowed SLR and tele-zoom lens. 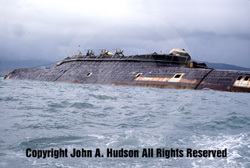 We cruised slowly around the vessel for upwards of three hours getting no closer than twenty or thirty feet. For the duration of our stay on the water there were no fireboats or any other official rescue craft which might suggest that either none was called or their arrival was delayed. 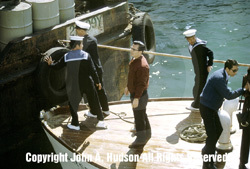 The only sign of officialdom was a harbour police launch that arrived and looked to be giving instructions to crew members assembled at the stern. A small contingent of junks, sampans, and work barges came and went. Some stayed alongside perhaps as they would have done on a more ordinary day. Few if any workers or crew appeared to be assembling onboard in the expectation of being taken off. None of the lifeboats were being swung into action. 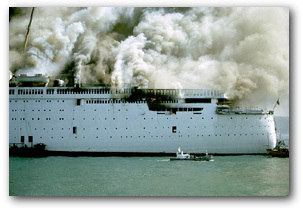 It was clearly evident that whatever was burning on board was more than a grease fire stemming from a worker accident. 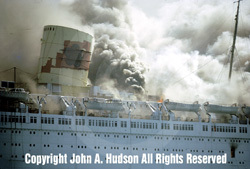 What had started as puffs of smoke from portholes turned into a raging inferno in the upper superstructure generating huge volumes of smoke. This, over only a three hour period. As the volume and intensity of the smoke increased we decided to move away. The wind had picked up and we did not want to get caught close up down wind if the direction of the wind changed. I was down to my last two or three frames, we were all thirsty, and there were calls for a bathroom break onshore. Our small boat had no facilities on board so after shooting off the last few frames we went back to shore. 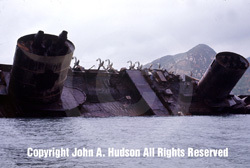 As for the crew and work force on board, thirty or forty people had been taken off during the afternoon by the Reverend Thomas Chow on board Day Spring V, a launch from The Mariners' Club. 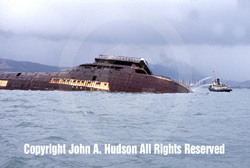 Other than those people whoever was on board when we first arrived on the scene was still on board when we left. 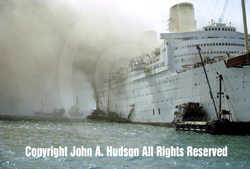 The smoke was by then so intense and dense that at times the whole ship was engulfed. 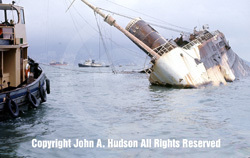 It could not have been a pleasant experience to have remained on board. 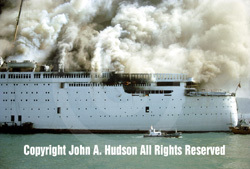 The fire burned for the next three days during which time the fireboats played a valiant but failing role. 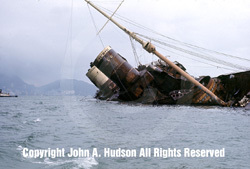 The vessel keeled over, sank onto the harbour floor and became a major navigational hazard. 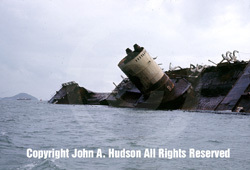 We took one last boat ride round the rusting hulk on 15 June 1972. A cloudy and dull afternoon and rather unfitting for the remnants of a former queen of the oceans that had sought a new and youthful life in service as a floating university. 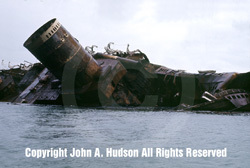 The vessel's last claim to fame was to star in a James Bond movie, The Man With The Golden Gun, after which the wreck was cut up and removed.